Red is energizing, warm, and excites emotions. The color red is used to express passion, desire, and strength. It can stimulate an appetite. Red can be assertive and at the same time, aggressive. It demands that you take notice and is used as a universal color for danger and to stop. While there is no danger in this exhibition, it does ask the viewer to stop and take notice. Seeing Red seeks to explore the current practice of using red clay as the chosen medium for contemporary ceramic artists. Earthenware and red clays have a long history in the art world, dating as far back as 500 BC and even earlier. Red clays have been used across the globe, from the ancient Greeks to the Moche civilization in South America to current artists in the field today. The artists included in this exhibition all have a different approach to the way they work with the ceramic medium, but all share the same passion and energy for choosing red. Donna Flanery and Molly Anne Bishop both incorporate their drawings and illustrations on their functional ceramics. Whimsical and dream-like, both artists have a sensitive touch to the way they treat the entire surface. 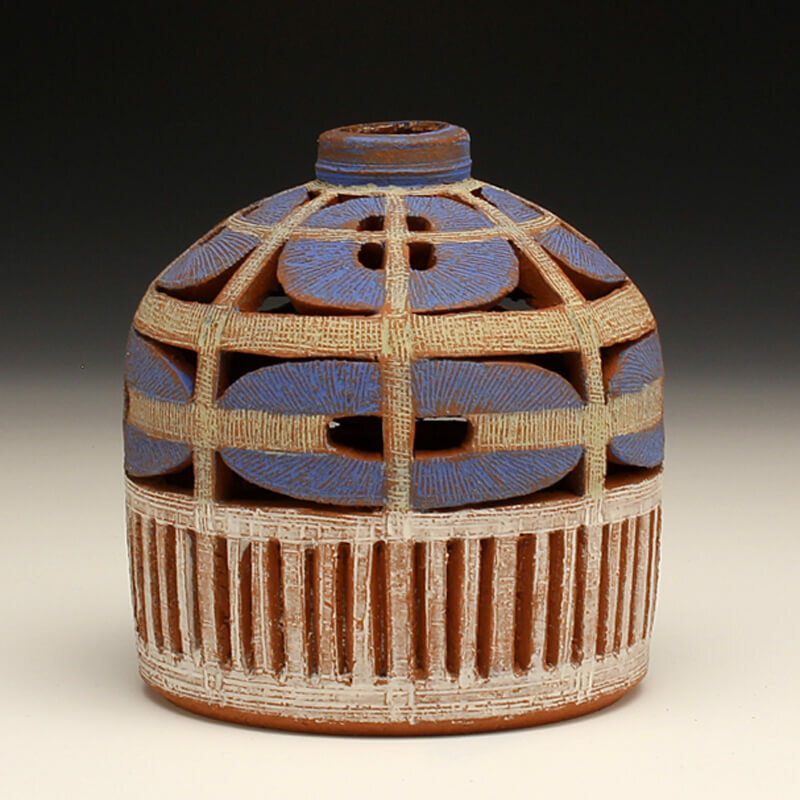 Miriam Griffin carefully carves highly detailed designs into her small pinched cups and lidded containers. The carving reflects the same delicate nature as her artworks. In contrast to the surface of Miriam, Matt Repsher creates pottery where the negative space of his cutouts become a delightful repetition. The black shadows of these spaces contrast well with his soft use of color. The characters that are the sculptures and objects of Tammy Marinuzzi live in a world where you want to visit. Each piece has a unique human emotion and expression that invites the viewer to participate in her world and create their own story. Rural landscapes and farm animals populate the pottery of Kip O’Krongly. She explores issues of food production, energy use, and transportation. Each piece has a story and a unique character, like a pig laughing in the clouds. Justin Rothshank and Arthur Halvorsen both enjoy color and they know how to use it. Their multi-layered surfaces blend colors, sometimes putting color on top of color. Staying inside the lines is not an option for these two artists. This expressive way of treating the surface is energetic and fresh, leaving hints of red at the bottoms of pieces and sometimes peaking through the white and colored layers.